Another example of how not to run a nation. For as long as we've been observing politics, the main obstacle to reforming our government is that too few voters understand the depth of our problems. Like the weather, everyone complains about our venal, corrupt, incompetent rulers. Until recently, most people never tried to do anything about it. Government employees and welfare recipients lobby for more tax money while we taxpayers pay for their time, but most working citizens are too busy making a living and paying taxes to participate in politics. The Tea Party frightens big spenders because it's made of sober citizens who understand spending's mortal threat to our society. Although most Tea Partiers are working people who don't really have time for politics, they know that unless they make time and take action, our society is doomed. We're thankful they caught on - hopefully, not too late. That's why we gave thanks for California. Having re-elected Governor Jerry "Mooneam" Brown who planted the seeds for economic disaster by permitting public-employee unionization four decades ago, California, we were sure, would prove a vivid lesson in the disaster of unlimited government spending. California has taught a lesson, but it's the opposite of what we expected: California has started to turn away from disaster by whacking spending instead of fueling the fire by raising taxes. What's more, Republicans stood firm against tax increases; the budget was balanced entirely with cuts. The fact that greatly-outnumbered California Republicans can force spending cuts by standing firm is the sort of news that the New York Times feels is utterly unfit to print. Our media downplayed the California budget solution based on spending cuts, but the European spending disaster was too big to ignore. The Greek financial crisis appeared on the radar early in 2010. It had two elements: a) the Greek government spends far more money than it gets in taxes and b) the Greek population is not being replaced. 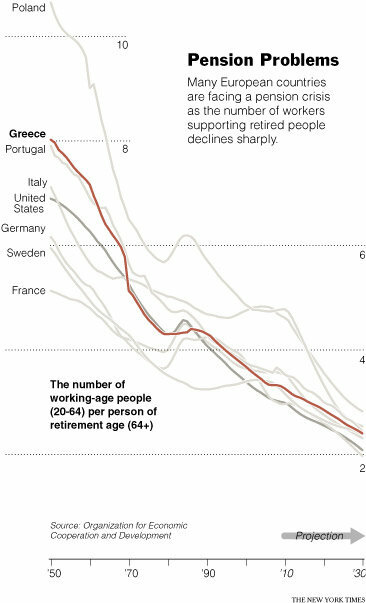 Without younger workers to pay into the government-controlled pension pyramid, borrowing would eventually hit the fan. As the crisis got worse, European politicians made futile gestures to hold back the tide. They didn't want to ask their taxpayers to cover Greek debt. They didn't want a Greek default - that would take down their "too big to fail" banks which they'd encouraged to buy Greek bonds. The story got more and more ink. The New York Times explained what's going on. Their columnist lived in Brussels in the early 1990's as the Currency Union which created the Euro was getting off the ground. Bureaucrats saw paradise - they'd control the money supply without having to answer to pesky voters! The Euro was created by the technocrats, not by the voters. Technologists generally look for efficiency - it would clearly be more efficient to do business in one currency instead of having to change from one currency to another all the time. Anyone who couldn't see how wonderful the Euro would be was a clod. How could anyone argue that European voters couldn't be trusted? Who started World War I, voters, or Kaiser Wilhelm of Germany and the ruling politicians of France and England? Who got the US into WW I, the voters, or President Wilson, with his notion of ending war by creating a one-world government through the League of Nations? Who caused WW II, the voters, or the idiotic European leaders who forced Germany into financial crisis through punitive reparations? After the Germans reacted to externally-imposed austerity by electing Hitler, they thought they could buy Hitler off with appeasement instead of taking a firm stand against evil. Was that the desire of the voters? Who imposed economic sanctions on Japan that caused them to attack Pearl harbor, the voters, or President Roosevelt? Who planned the attack on Perl Harbor, Japanese voters or the ruling clique? Who caused WW II, voters or elites? If history shows anything, it shows that our ruling politicians can't be trusted! Voters occasionally want to go to war - many 1930's Germans were raring for revenge - but it's usually the other way 'round. We thank Europe and the New York Times for reminding us that our technocrats, no matter how clever, mess up more often than not. The Euro is at the extreme end of our culture - technology axis. Managing one currency was more convenient for the bureaucracy than one currency per nation, but the explosion was inevitable because European economies grow at different rates. In the old days, if the Greeks borrowed too much money, the value of the Greek drachma would go down so they couldn't buy as much from abroad. This cut their consumption of foreign goods. Market-driven devaluation limited government borrowing. With all countries using the Euro, however, the Greeks can't devalue. The only way to deal with excessive borrowing is via tax increases and drastic spending cuts, hence, rioting in the streets. But the real problems emerge from the technocratic mind-set, from the arrogant gray men who believe they can engineer society, oblivious to history, language, culture, values and place. Could it be that the New York Times has realized that too much diversity within a single set of rules isn't a strength, but rather a critical weakness? We can only suppose some copy editor was half asleep when this nugget got by. The men who wrote our Constitution were well aware that rulers are fallible, mortal, greedy, selfish, pig-headed, shortsighted, arrogant human beings, just like everybody else. They give very few powers to the Federal government and split power between different centers to the maximum possible extent. Instead of lumping all the diverse colonial cultures under one all-powerful government, they planned that when a problem came up, each state could try a different solution and voters could copy whatever worked. We're thankful that Massachusetts tried Romneycare - we know from the explosion in cost, complexity, and waiting times that that model doesn't work. Obamacare won't work either. How certain are we? When Scott Brown ran to fill Teddy Kennedy's Senate seat, he promised to be the 40th vote against Obamacare in the Senate. Taxachusetts voters, the bluest of the blue, elected a Republican to fill a Senate seat that had been Democratic for the past 60 years, based on his express promise of not inflicting the same failed healthcare scheme nationwide. Alas, Obamacare passed, but the Democrat voters of Massachusetts did their best to preserve us from that fate based on their own state's bad experience. We're thankful that Vermont enacted a single-payer health care system, as the voters of Vermont have every right to try. We're convinced it won't work based on how it's operated in other countries, but maybe Vermont can find a Leader of Genius who can overcome human nature enough to make it work. If not, they'll be a far more local and visible illustration how single-payer government healthcare leads to rationing, misery, and death. Unfortunately for America, our federal government has been expanding its power at the expense of state power ever since Senators stopped being appointed by state governments back in 1913. Technocratic "one size fits all" policies don't work across the diversity of cultures and situations we find in the various states. To try to suppress nationhood and concentrate power at the centre of a European conglomerate would be highly damaging and would jeopardize the objectives we seek to achieve. Europe will be stronger precisely because it has France as France, Spain as Spain, Britain as Britain, each with its own traditions and identity. It would be folly to try to fit them into some sort of identikit European personality...We have not rolled back the frontiers of the state in Britain to see them re-imposed at a European level, with a European superstate exercising a new dominance from Brussels. Exactly so. Get back to the "organic realities" of each nation having its own culture. Stop trying to cram all that diversity under one set of rules. Discard the technocratic, "one size fits all" mind-set that emanates like foul swamp gas from the Beltway Bandits and from the palatial offices of the Brussels Eurocrats. The Tea Party is right about getting back to the Constitution. America has a host of seemingly intractable problems - immigration, health care, welfare, pensions, education, infrastructure, to name but a few. The only way to find solutions that work, as opposed to enriching politicians and their supporters, is to try different solutions in different places. Arizona and Alabama have tried to deal with immigration in one way; sanctuary cities like Berkeley, CA and New York have taken a different approach to immigration. Montana is working gun control, as is Wyoming. Vermont and Massachusetts have different solutions for health care from Texas, which has its own approach to job creation. Our Founders gave us the "laboratory of democracy" which served marvelously for two centuries; we must chop back the dead hand of Federal programs to let that great laboratory work. On this Thanksgiving day, we give thanks for the European crisis. It showed the world that centralized, rule-based solutions to cultural problems are so unworkable that even the New York Times argued that we must discard the technocratic mind-set and set the nations of Europe free to follow their cultural destinies. Unfortunately, technocrats revel in undeserved power and influence. They will not go gentle into that good night where they belong. We'll have to throw the misguided rascals out - here in America, across the pond in England, in continental Europe, and everywhere else where arrogant blowhards and professional busybodies think they know better than everyone else. 2012 is coming; give thanks! We should also give thanks to the American people for voting obama into office. Without him we would be reaching across the aisle and compromising what little is left of our freedoms away. He has shown us what a marxist, socialist, fascist state looks like in a remarkable short period of time. Without him there would be no Tea Party that has finally exposed the duo-party system of big government. Yes Virginia, there is a Santa Claus. Why are nations like Germany and the U.S. rich? It’s not primarily because they possess natural resources — many nations have those. It’s primarily because of habits, values and social capital. It’s because many people in these countries, as Arthur Brooks of the American Enterprise Institute has noted, believe in a simple moral formula: effort should lead to reward as often as possible. People who work hard and play by the rules should have a fair shot at prosperity. Money should go to people on the basis of merit and enterprise. Self-control should be rewarded while laziness and self-indulgence should not. Community institutions should nurture responsibility and fairness. This ethos is not an immutable genetic property, which can blithely be taken for granted. It’s a precious social construct, which can be undermined and degraded. Right now, this ethos is being undermined from all directions. People see lobbyists diverting money on the basis of connections; they see traders making millions off of short-term manipulations; they see governments stealing money from future generations to reward current voters. The result is a crisis of legitimacy. The game is rigged. Social trust shrivels. Effort is no longer worth it. The prosperity machine winds down. Yet the assault on these values continues, especially in Europe. The estimated costs of these bailouts vary enormously and may end up being greater than the cost of German reparations after World War I. Germans are being browbeaten for not wanting to bail out Greece, where even today many people are still not willing to pay their taxes. They are being browbeaten for not wanting to bail out Italy, where future growth prospects are uncertain. They are being asked to bail out nations with vast public sectors and horrible demographics. They are being asked to paper over fundamental economic problems with a mountain of currency. It’s true that Germans benefited enormously from the euro zone and the southern European bubble, and that German and French banks are far from blameless. 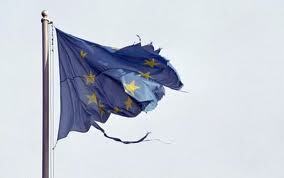 It’s true that the consequences for the world would be calamitous if the euro zone cracked up. But our sympathy should be with the German people. They are not behaving selfishly by insisting on structural reforms in exchange for bailouts. They are not imprisoned by some rigid ideology. The scariest thing is that many of the people browbeating the Germans seem to have very little commitment to the effort-reward formula that undergirds capitalism. On the one hand, there are the technicians who are oblivious to values. For them anything that can’t be counted and modeled is a primitive irrelevancy. On the other hand, there are people who see the European crisis through the prism of some cosmic class war. What matters is not how people conduct themselves, but whether they are a have or a have-not. The burden of proof is against the haves. The benefit of the doubt is with the have-nots. Any resistance to redistribution is greeted with outrage. Europe’s challenge is not only to avert a financial meltdown but to do it in a way that doesn’t poison the seedbed of prosperity. Which values will be rewarded and reinforced? Will it be effort, productivity and self-discipline? Or will it be bad governance, now and forever?